Deepak and Rebecca recently visited India. Rebecca tells us about some of the things she saw. 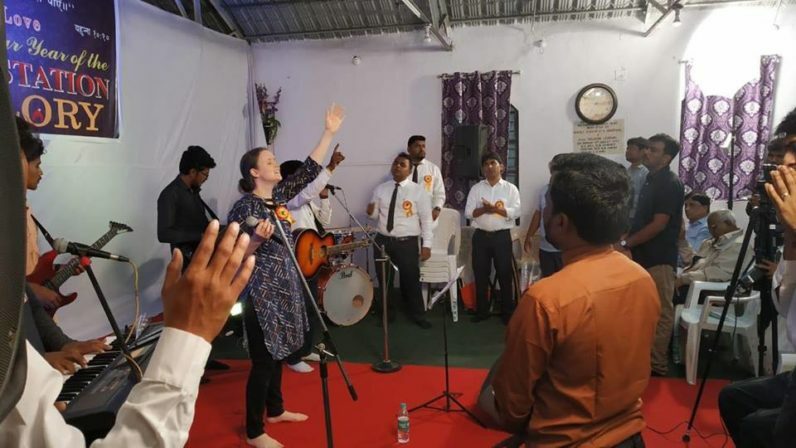 Our time in India was incredible- from seeing God’s power move in healings and deliverances to seeing the passion people have for serving God. It was go go go from the day we arrived! 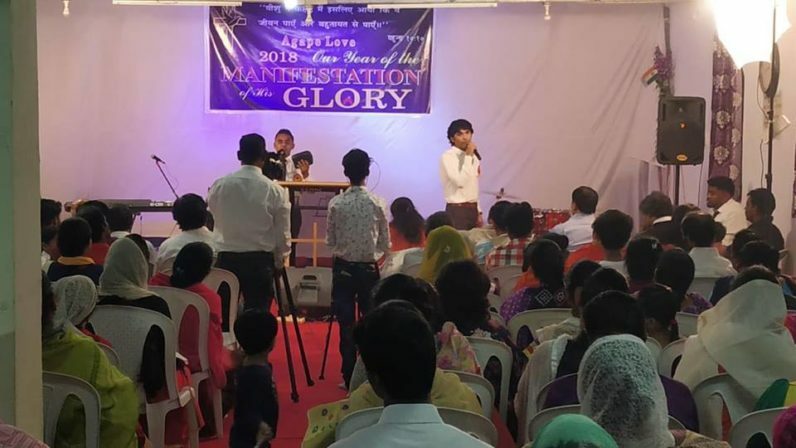 Deepak preached at a Church service the day we got into Nagpur and the next day there was an all-night prayer meeting for the event we would be ministering at in a few days time. The main organiser of the event was a man named Prufel – a prayer warrior who prays through the night. The event was set to be on the main day of Divali. For that reason we were concerned that we would not get that many people but Prufel trusted God. He was also adamant they would not ask anyone for any money towards running the event as God had said he would provide. They wanted to put on a meal for everyone who came (very important in Indian culture) which they estimated would be near to 200. Despite our concerns about Divali there was an amazing turn out and we had over 200 people attending and they had to put chairs up outside for the extra people! Deepak preached on the Kingdom of Heaven and I led worship with the local team there. We prayed for what seemed like everyone afterwards and saw amazing healings. There was a guy with a swollen arm. He looked like he was in great pain and couldn’t move it. We didn’t know if it was broken or what had happened. But ten minutes after being prayed for his arm was completely normal and he could move it freely. By the end he was crying with relief as he shared what had happened. A lady came forward for a word about a skin problem. She had spots on her skin and said they were fading since the prophetic word was given. Another lady had a fractured ankle and found walking very painful. After prayer though she said the pain had gone and even that she had felt the bone come together! Every day was filled with prayer, thanking God, talking about God and ministry opportunities. I was so inspired and challenged by the way people are so God-focused out there. The most common greeting amongst believers is not, ‘Hi, how are you?’ but, ‘Praise the Lord!’ Every meeting, whether you go for dinner at someone’s house or just for coffee, always involves prayer. On Sunday I preached at Shakhurs (Deepak’s prayer partner’s) Church. Almost all the congregation used to be Hindu and I’ve never seen such joyful praise and worship before. It just went on and on! Ministry afterwards was really powerful with people overwhelmed by Gods power and being set free. The following week we had a huge family celebration. This was sort of like a second wedding for us. It was so joyful and many of the people that were involved in the ministry event came too. Anup – a local pastor gave a message and prayers were said for us, it was a real blessing and we felt so loved! On the last day we went to see an uncle who had kept inviting us to come for a meal. We were all chatting together but then he wanted to speak in private with Deepak and his brother. He shared that he was suffering from great anxiety. He had charms around his wrists and a room full of idols but could not find peace. Deepak explained about the power and love of God and led him in a prayer committing his life to Christ. Afterwards he sat there in great stillness. Deepak asked him what he felt. He said ‘’Shanti’’ – which means peace! He went on to say he had not felt peace like that for years. It was so wonderful to see the difference in his countenance after encountering Jesus – the Prince of Peace. We just had a wonderful time and I was blown away by the love people have for one another. They seem to want to be together all the time, talking, praying, whatever it may be it’s all done with one another. There is a thirst to pray, to serve God and to know the word of God. Their faith is so simple: if God says he will heal he will heal, if God says he will provide, he will provide… It was truly life-giving to be there and I hope to keep the things I’ve seen and learnt with me. Bernice is a valuable part of Jubilee and an experienced blogger. She loves social media and has successfully experimented over the years with all kinds of creative ways of using her skills in connecting people across the world through art, textiles and the Bible!